Jane E. Caramante (nee Bungay), 96, passed away on September 21, 2017 at Silver Lake Nursing Home. 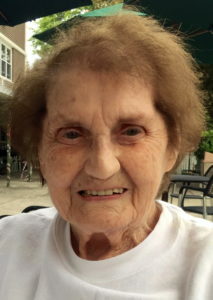 Jane was born in Staten Island, NY in 1921 and lived in Mariners Harbor all of her life and had resided at Silver Lakes Nursing Home for the last 4 years. She enjoyed being on the bowling league and was an avid Yankee fan. She was predeceased by her late husband Frank, her daughter Bonnie and her two grandson, James Jr. and Jack Long. Jane is survived by her loving grandson, Jeff Long and four great grandchildren, James III, Breanna, Jennie and Gianna Long. Funeral services will be held at Cherubini McInerney Funeral Home, 1289 Forest Avenue, Staten Island, NY on Saturday at 10:00am. Friends will be received on Friday from 2-4pm & 7-9pm. I’m so sorry to hear about your family member’s passing. During my experience of grief I was comforted by what the Bible’s hope for the future will be. Revelations 21:4 state: and he will wipe out every tear from their eyes and death will be no more, neither will mourning nor outcry nor pain be anymore. The former things have passed away”. What a wonderful prospect that will be for the resurrected ones to live iunder perfect conditions! My hope is that you and your family are comforted by what the Bible’s hope for the future will be. My condolences are with you and your family at this time.